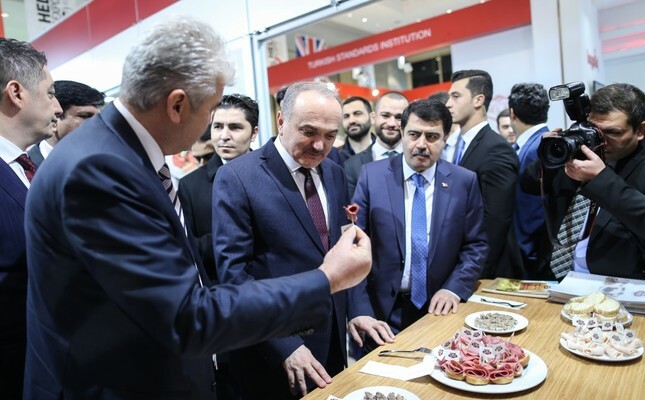 Minister of Science, Industry and Technology, Faruk Özlü, (second from the left), visits the stands in the exhibition area at the World Halal Summit in Istanbul. To establish a worldwide standard for halal certification, the World Halal Summit, organized under the auspices of the Presidency and in cooperation with the Standards and Metrology Institute for Islamic Countries (SMIIC), brought together high-level speakers from 60 countries, prominent figures in the global halal industry. As part of the summit, held for the second time this year, in Halal Expo 2016 leading enterprises in the halal industry exhibited their products. Moreover, the summit had various conferences on halal food and gastronomy, Islamic finance, halal tourism, halal medicine and pharmaceuticals. According to International Monetary Fund (IMF) data, the world food and beverage expenditure was $6.7 trillion in 2014 and $1.1 trillion was from the halal food and beverage trade. This figure, which has increased steadily in recent years, is predicted to reach $1.6 trillion by 2020. The minister noted that halal certification activities would be important for producers to enter markets in Islamic countries, in particular, adding that the main problem is “the lack of common standards set in the field of halal certification and different practices in halal certification.” Emphasizing that this situation creates an irregularity in practice as well as an obstacle to the development of international trade, he highlighted that they should get rid of basic understanding and application differences in halal certification. United Fund Bank Inc. General Manager and Board Member Ömer Kalav said that interest-free banking practices in Turkey are not very rooted. In a panel, “Economic Crisis from the Islamic Finance Window,” organized within the scope of the World Halal Summit, Islamic Law, Islamic Banking and Financial Adviser Edib Smolo, said that the last financial crisis was the greatest crisis since the Great Depression and that this showed the flaws in the conventional financial system and that there is no single reason or criminal to be pointed out even seven or eight years after the financial crisis. Smolo pointed out that many problems and many mistakes caused this crisis; some of them are lack of regulation and supervision, an uncontrolled increase in debt, mismanagement of risks and lack of transparency. When looking back at the recent crisis, he said that people used loans for many years, even those who did not need loans for investment purposes. “But then interest rates started to rise again, so they had trouble paying,” he said.